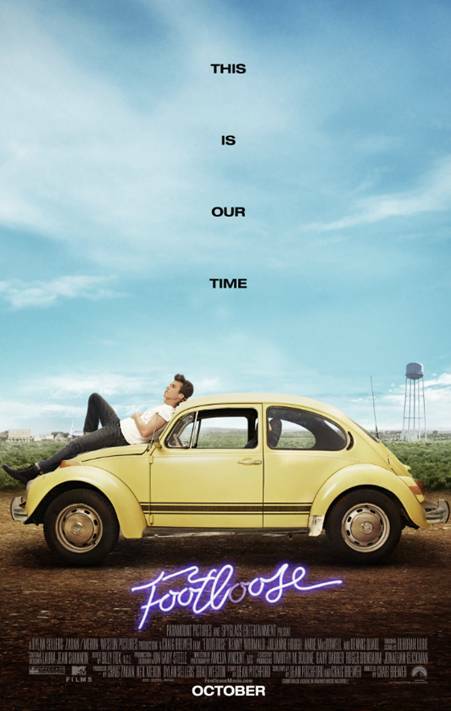 With a tagline of “this is our time,” and a new trailer that features synchronized dancing and high jumpers, the Footloose remake may be more ridiculous than I had thought possible. It’s bad enough that Paramount decided to re-tred sacred ’80s film ground (and it’s not the first), but now we get the first real trailer of the film by writer/director Craig Brewer (Black Snake Moan), and it looks to be as bad as I feared. Ren MacCormack (played by newcomer Kenny Wormald) is transplanted from Boston to the small southern town of Bomont where he experiences a heavy dose of culture shock. A few years prior, the community was rocked by a tragic accident that killed five teenagers after a night out and Bomont’s local councilmen and the beloved Reverend Shaw Moore (Dennis Quaid) responded by implementing ordinances that prohibit loud music and dancing. Not one to bow to the status quo, Ren challenges the ban, revitalizing the town and falling in love with the minister’s troubled daughter Ariel (Julianne Hough) in the process. My first problem with the whole concept of remaking this seminal Kevin Bacon-starring dance flick is that it’s potentially anachronistic. What was a believable–if improbable–concept in the first film, might become ridiculous in the second. Back in the early ’80s, it wasn’t total lunacy to imagine a small Midwestern town outlawing dances and loud music as a reaction to the deaths of some teenagers. But in today’s world? I’d like to see some preacher try to start a conservative movement banning dance and loud music. That concept becomes kind of idiotic in this day and age. The leaping dancers in the trailers, and the “street” type dancing throw-down ala Step Up 3D, all reinforce my feelings that this movie will be less of an invigoration and more of an embarrassment. Check out the trailer below. What do you think?